At Marketing TEA, we know the VITAL role that social media plays in growing your business. At this point (because it’s 2018), we hope that you have also recognized the upside that social media COULD offer your business, even if you haven’t fully taken advantage of it yet. Creating direct connections, showing off killer content, giving away information and advice, participating in your community, maybe even buying the cheapest ad space out there. So yea, social media matters! We get asked by a lot of people exactly which social media platforms we recommend. 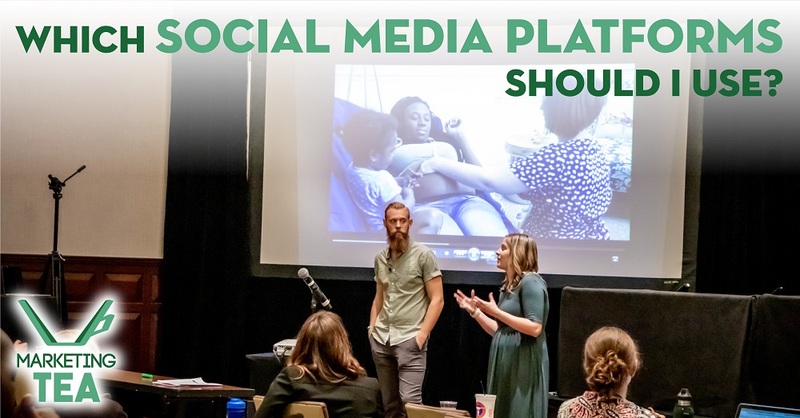 And while the complicated answer may have Tyler going off on an hour long speech about embracing your personality, today we’re going to keep it simple with our best general recommendations for our TOP social media platforms you should focus on. First is worst. (Just kidding) We get asked about Twitter a lot, which is why it’s in this blog post, even if it isn’t one of our top picks. It’s a quick way to make a joke, and it can relay information at the speed of light. Our main beef with Twitter is that it’s really hard to gain a following on Twitter right now. If you’ve already got 100k followers, you likely aren’t reading this blog anyways. But if your follower count is non-existent like most small businesses getting a start on their social media, it’ll be nearly impossible to up those follower numbers. Our #bottomline? Twitter makes it hard for you to gain traction and attention. So typically we’re going to recommend that you check out a different platform that can perform faster. A Marketing TEA pro tip? Instagram doesn’t allow you to post a link in a picture’s caption, so if you want your website to see some traffic, you might need to instruct followers how to get there. Use that ‘LINK IN BIO’ like we do on many of our @marketingtea posts. But wait there’s more! Facebook Ads (which includes Instagram ads) is one of the most impactful and cost-efficient ways that you can get your content in front of your target audiences. When you create a great piece of content, don’t forget to use Facebook Ads to reach brand new people. Feel free to chat with us if you don’t believe what a massive impact this can make, and we’ll share some things that will blow your mind about Facebook Ads. So there you have it! Our top 2 social media platforms that we believe you should be focusing on: Facebook and Instagram. Is there value to be found in other platforms out there? OF COURSE! But we need to end this blog post at some point, so we can’t cover them all. If you’re curious about exploring or finding out about other social media platforms, or if you’d just like to learn more about our top picks of Facebook and Instagram, get in touch with our team. We’d love to talk more about how you can use digital content marketing to grow your business!